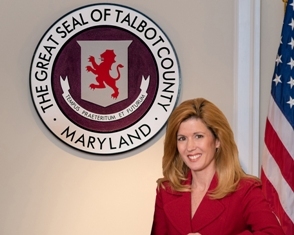 LAURA EVERNGAM PRICE, elected in 2010, is serving her third term on the Talbot County Council. Mrs. Price was born and raised in Easton, and her family has lived on the Eastern Shore for many generations. She attended Easton High School until moving to Delaware to train as a national figure skating competitor. After graduating in 1984, Mrs. Price attended the University of Delaware and continued her skating career, coaching all ages of figure skaters for many years. She and her husband Richard are small business owners and have operated Ship and Print Place in Easton since 2002. They have two children, Nicholas and Justin, both of whom graduated from Easton High School and are active in their local Boy Scout Troop as Eagle Scouts. During her time on the Council, Mrs. Price has represented Talbot County on several boards and committees. She serves as Council liaison to the Airport Board, Board of Education, and Tourism Board. Additionally, she serves as legislative liaison to MACo, the Maryland Association of Counties, as well as serving on their Executive Board of Directors. Mrs. Price has also been a member of the Mid-Shore League of Republican Women since 2002. She was crowned Mrs. Maryland America in 2005 and promoted a platform of healthy lifestyles. She is the now the state director of the pageant and encourages women to serve their communities while achieving their best.